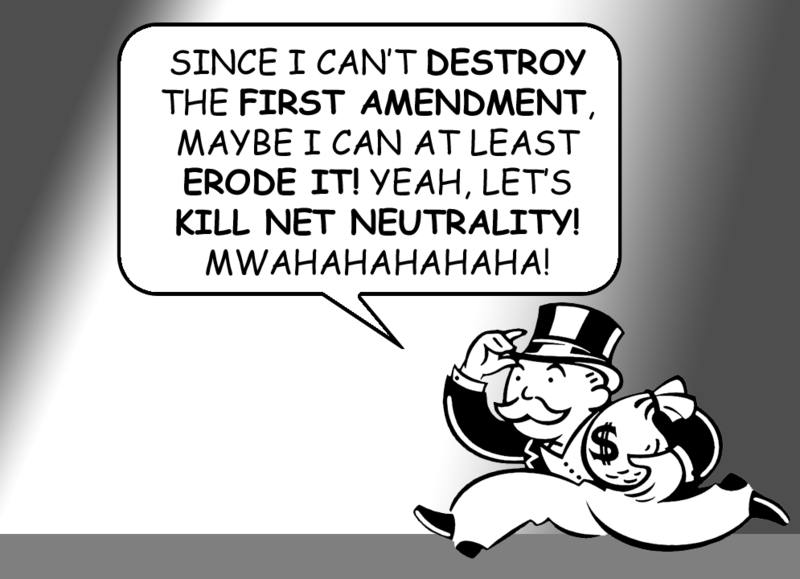 Well, here we go again: a powerful committee in the U.S. House of Representatives has introduced a bill that would kill the FCC's Open Internet rules – or, so-called “Net Neutrality” rules – that we fought hard for and won after a long battle alongside a broad coalition of civil society organizations, Internet freedom groups, and millions and millions of Internet users. Now, unlike other threats that have emerged in Congress, this sneak attack is particularly troubling because it's hidden deep inside a big funding package that the House needs to pass so that the government can continue operating. Congress could vote for a bill as soon as next week that could destroy Net Neutrality. To fight back, we joined with dozens and dozens of civil rights, Internet freedom, and civil society organizations, as well as tech companies and innovators, to pen an open letter to key decision-makers demanding they stop this sneak attack at once. You can see the letter below. Now we need them to listen to Internet users everywhere who have demanded an end to Big Telecom’s dangerous Internet slow lane plan, and stop these reckless measures dead in their tracks.